Incident Details: The Team were paged to respond to a man who had fallen out of his sailing dinghy 100m offshore, and was shouting for help. His boat had capsized and the mast was stuck in the lake bottom. 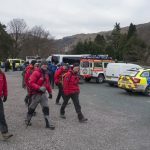 Following a well rehearsed routine, the Team asked if either of the local marinas could despatch a safety boat, whilst swiftly despatching its own inflatable boat and crew in a vehicle down to Kettlewell. Fortunately a boat from Nichol End marine responded, picking a Keswick MRT Swiftwater technician at the Keswick boat landings en route. A second boat from Derwent Marina also set off, crewed by a KMRT technician. The first boat was swiftly on scene, and picked up the man who was unhurt. They returned him to the Kettlewell car park where he was checked over by an NWAS paramedic. The boat crew then went and retrieved the dinghy, and returned it to shore. All boats then stood down, and the Team returned to base. Time taken to retrieve the stricken sailor, from the first page to the Team, to him being brought ashore, was 28 minutes. 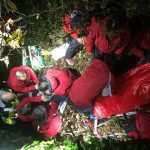 Considering that Team members had to get to base, contact the various assets, kit up and then get to the scene, that felt like a very efficient response. Our thanks to Nichol End and Derwentwater marinas for their speedy response.